Are you asking needs oriented questions in your sales meetings? For any salesperson needs oriented questions, and the requisite ability to listen that goes hand in hand with them, are by far the most important of the wide range of skills needed for high performance. 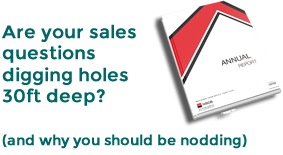 In fact, we’d say Needs oriented questioning is the most important part of any sales meeting. It’s simple really. Unless you can uncover the needs of your clients in a credible, intelligent and empathic way, you can’t possibly hope to develop solutions to meet those needs. Your questioning strategy should revolve around making the discussion conversational. It should be kept light and relaxed rather than interrogational. When your client is at ease and relaxed they’re much more likely to reveal more information about themselves and their business. It is all about relationships and trust, when you first meet a client you have to build this trust, at subsequent meetings you need to maintain it. There are basically 3 types of questions – High-level questions, Needs-oriented questions and Fact-finding questions. Whilst there are no hard and fast rules, and each sales meeting is different, the general rule is that these questions should be used in the ratio of 1-3-5, that is 1 high-level, 3 needs-oriented and 5 fact-finding, with the intention that both you and your client will be comfortable with this mix. To build sound relationships with your clients you have to find out certain pieces of information about them. Could be history of the business or individual, what the business does, markets they operate in, how they sell and how they take their product to market. You also need to find out specific pieces of information, technical or processing aspects of their businesses. Maintaining a good mix of questions will ensure that you elicit this information in a way that your client finds comfortable and helps you build stronger relationships.